A Year of Being Here: Dana Gioia: "California Hills in August"
"California Hills in August" by Dana Gioia, from Daily Horoscope. © Graywolf Press, 1986. 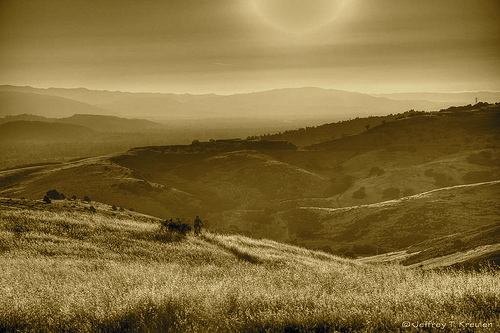 Photography credit: "California Hills," by Jeff Kreulen, 2009 (originally color). I am a transplanted Californian but well into my state citizenship, over a third of my life here now. 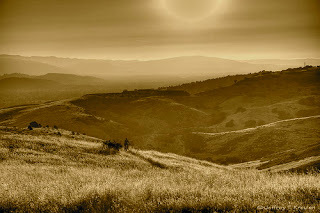 And I have grown to love those California hills, now golden, now green and bursting with life. There are likely unwritten poems on them deep in my unrecorded self. So I met this poem with a sense of joy, with a 'yes that is my unarticulated thought,' with a sense of gratitude that Mr. Gioia had taken the time to assemble this verse. Very nice.